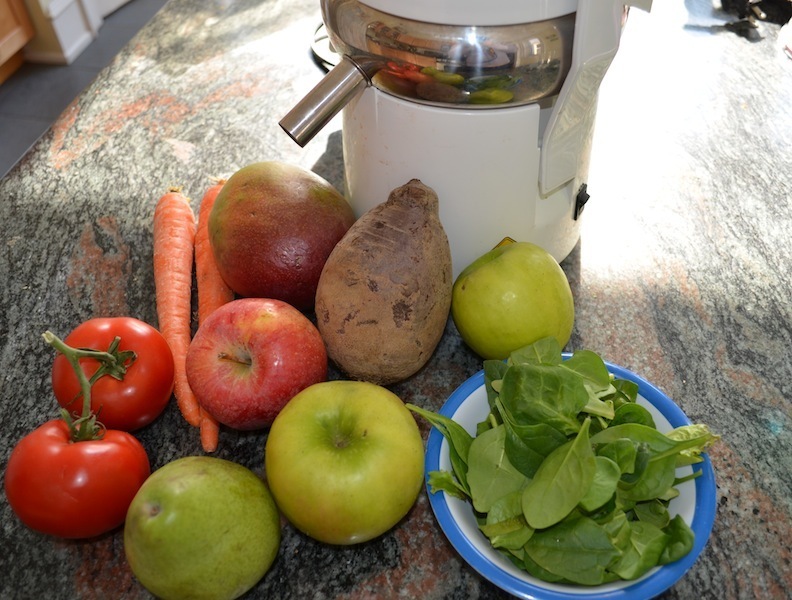 Juicing is a great way to get lots of healthy fruits and veggies into your family in liquid form. Of course, we suggest serving the fresh, whole forms of nature's goodies on everyone's plate on a regular basis. But we know that juices are a good, quick fix for busy mornings or for occasionally adding in certain ingredients that your kids might push away on a plate. These recipes range from kid-approved traditional favorites (like apple orange) to the more exotic and adventurous (beet, spinach and apple, anyone)? As always, we recommend using organic fruits and veggies whenever possible. This is especially important for juicing since we are concentrating the fruit in its natural, raw state! And, unless noted, the fruits and veggies do not need to be peeled before juicing, but they should be chopped or sliced into pieces before adding to the juicer (no seeds or pits, please)! Read on for 6 quick and easy juice recipes that are tasty and full of nutrients. 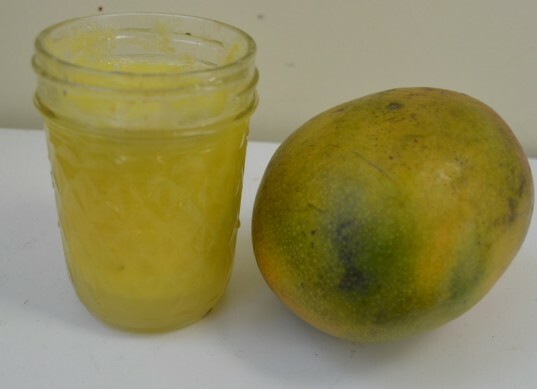 Peel and chop the mango before juicing. Juice all the ingredients, beginning with the kale. 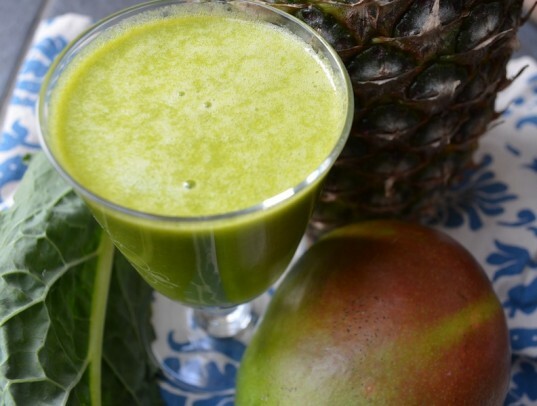 The pineapple and mango make a super sweet juice, which the kale helps tone down (and also adds big doses of Vitamin A,C, and K). Makes 1 8oz serving. Juice all the ingredients. Juice the spinach first since it doesn’t yield much juice. This juice is a great alternative to the commercial bottled and packaged veg-fruit combos and includes a huge serving of spinach! Makes approximately 1 8oz serving. Peel the mango and cut into pieces before juicing. Juice the mango and the pear. This is a delicious, creamier juice due to the mango’s texture. It has a sweet flavor that kids (and grown-ups) are sure to love. To give it a more tropical flair, stir in or top with shredded coconut. Makes approximately 1 8oz serving. Peel the beet before chopping then juice all the ingredients. This juice is an absolutely beautiful color and a surprising way to incorporate beets into the family’s diet. We really enjoyed this juice as is, but you can also add a little orange juice or juice another apple to sweeten it as well! 2 apples 2 oranges Juice the apples. Mix with orange juice squeezed using a traditional, non-electric hand juicer -- the kind where you halve an orange or lemon and place it on and squeeze. Citrus fruits are not meant to be juiced in some juicers but will easily yield their own juice. If your juicer can tolerate citrus fruits, juice away! Mix together and serve. Makes approximately 1 8oz serving. This is a good juice for beginners because it has common, beloved ingredients. 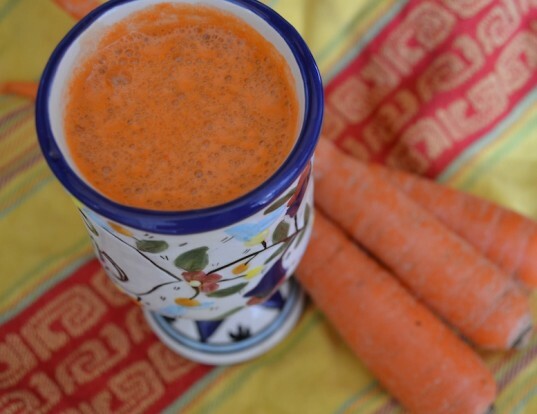 Another easy variation: juice 2 carrots instead of the apples for mixing with the orange juice. 2 carrots 1 pear 1 orange Juice the carrots and pear in the juicer. Juice the orange using a traditional, non-electric hand juicer unless your juicer can handle citrus fruits. Combine and mix well. 1-2 cups loosely packed chopped kale, ribs removed (about 3-4 leaves) 1 mango 1 cup chopped fresh pineapple Peel and chop the mango before juicing. Juice all the ingredients, beginning with the kale. The pineapple and mango make a super sweet juice, which the kale helps tone down (and also adds big doses of Vitamin A,C, and K). Makes 1 8oz serving. 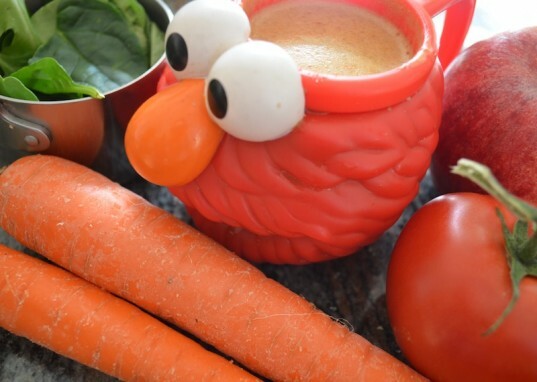 1 cup spinach 2 carrots 1 tomato 1 apple Juice all the ingredients. Juice the spinach first since it doesn't yield much juice. This juice is a great alternative to the commercial bottled and packaged veg-fruit combos and includes a huge serving of spinach! Makes approximately 1 8oz serving. 1 mango 1 pear Peel the mango and cut into pieces before juicing. Juice the mango and the pear. This is a delicious, creamier juice due to the mango's texture. It has a sweet flavor that kids (and grown-ups) are sure to love. To give it a more tropical flair, stir in or top with shredded coconut. Makes approximately 1 8oz serving. 1 cup spinach 1 medium size beet 1 apple Peel the beet before chopping then juice all the ingredients. 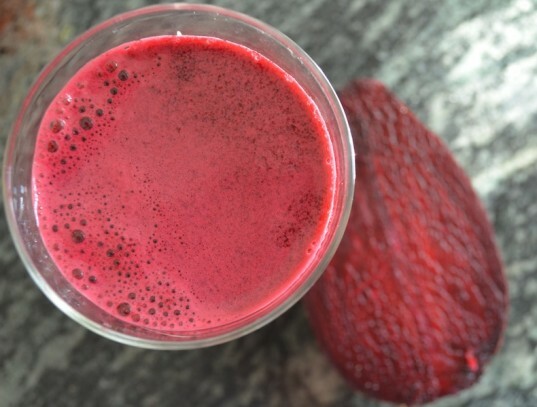 This juice is an absolutely beautiful color and a surprising way to incorporate beets into the family's diet. 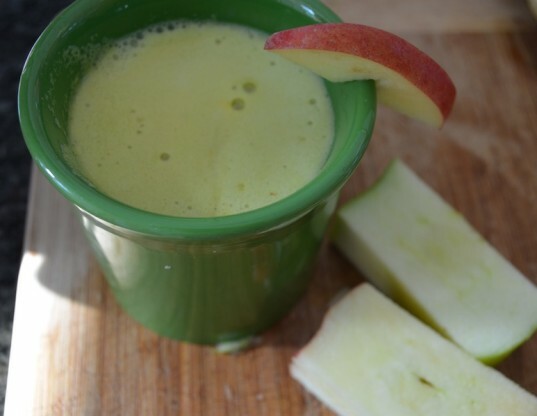 We really enjoyed this juice as is, but you can also add a little orange juice or juice another apple to sweeten it as well!